The BMW X5 35d hit 170,000 miles and that meant it was overdue for an oil change. The last change was also the high end imported Ravenol, but required an extra quart about 4000 miles ago. I suppose that is par for the course now that this diesel is 8 years old? 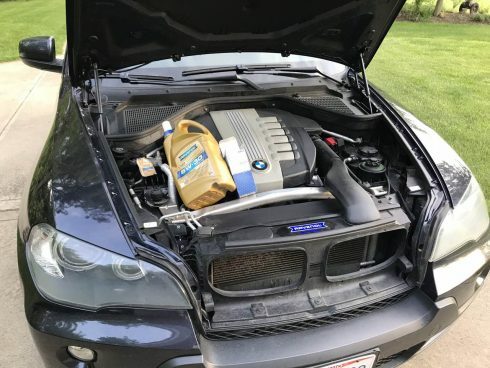 Nevertheless, I do feel spending $80 for 8 quarts of oil and a filter is a bit high for this old of vehicle, but if it prevents early engine and twin turbo wear for another 15,000 miles perhaps it is worth it. For the last year or so the X5 has been performing flawlessly. Up until my last fuel fill I haven’t had any engine or electrical faults to check on or clear. Unfortunately after the last fuel fill at UDF, a check engine light came on. My initial thought was a loose fuel cap, but re-seating it did not solve the problem. I plugged in my Carly for BMW dongle and iPhone app to clear the code but it continues to return. Pull the printout (below), but I have not been able to figure it out.